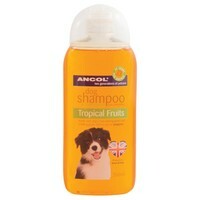 Ancol Tropical Fruits Dog Shampoo 200ml is a specially formulated shampoo and conditioner for all coat types. This fantastic shampoo has been made with a blend of the finest quality natural ingredients that help to soothe the skin while giving the coat a deep clean. Also with added Chamomile, Aloe Vera and Lavender Oil, this shampoo cleanses and nourishes your dog's skin and coat for even better health.